Women in Auto Care has announced the recipients of the 2018 Women of the Year Awards. 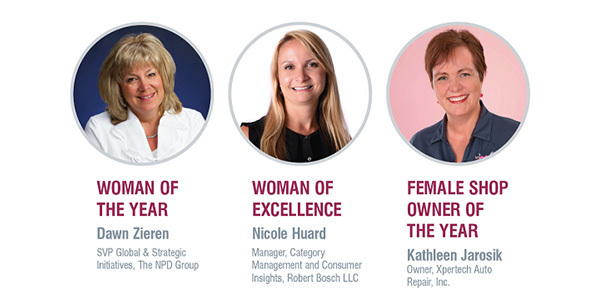 The Women of the Year Awards include the “Auto Care Woman of the Year,” “Auto Care Woman of Excellence” and “Female Shop Owner of the Year,” which annually recognize the outstanding female contributors making a difference in the automotive industry. The three recipients of the Women of the Year Awards will be recognized at the Women in Auto Care press conference and awards ceremony on Oct. 30 from 4-5 p.m. at the Venetian Hotel, Casanova Room 505 in Las Vegas. The event is open to all AAPEX attendees and will be immediately followed by the Women in Auto Care reception. Dawn Zieren’s dedication to best-in-class client and retailer partnerships and a strong collaboration with the Auto Care Association helped NPD to develop and expand its aftermarket point-of-sale data model and also spearheaded the development of a syndicated consumer tracking service. Dawn has been an active and passionate mentor, strongly influencing future female executives through leading by example in her role at NPD, and serving on the board of directors as membership chair of Women in Auto Care. Investing in others and their career development is what motivates and excites her. Zieren has been a speaker at various events including Women in Auto Care conferences, the Auto Care Association’s Leadership Days, and at the University of Houston. She previously served on the board of directors and is a past president of the American Marketing Association. Nicole Huard has a passion for recruiting and developing women within the Auto Care industry. She is a founding member of the [email protected] business resource group in North America, with more than 1,500 members. [email protected] helps promote gender diversity and inclusion while focusing on recruitment, retention and professional development of women at Bosch. The group aims to educate and empower all associates on current gender diversity issues in the workplace. Huard is an active member of the Auto Care Association and currently serves as the chair of the Auto Care Category Management Committee. She also is a member of Women in Auto Care and YANG. Kathleen Jarosik says she has made four pivotal decisions that have changed her life: becoming a NAPA Auto Care center and utilizing its extensive benefit and training network to learn and grow in the industry; finding a business coach; joining Repair Shop of Tomorrow, to further educate her in marketing, operations and efficiency; and becoming a member of Women in Auto Care, where she has learned the importance of encouraging and empowering others to strive for excellence in this incredible industry. She is very involved in the leadership and volunteering initiatives in her local community and aims to increase awareness and spark interest in choosing a career in the automotive field for young women. The Women of the Year awards are administered by Women in Auto Care volunteer committee members. The Woman of the Year is chosen based on her significant leadership and contributions to the auto care community throughout her career. Female Shop Owner of the Year is given to an outstanding woman who has a proven record of excellence in the automotive service industry, and the Woman of Excellence is the Women in Auto Care associate who has provided recent outstanding contributions to the auto care industry. For more information about Women in Auto Care or the Women of the Year Awards, visit autocare.org/women-in-auto-care-awards or contact [email protected].